carries the classic—wood rocking horses, tops trains, and doll furniture. Preschoolers crowd the floors when there are wood toys from Absolutely Terrific Wood Toys to play with. In the age of electronics, there is still room for wooden children’s toys. Parents love the quiet playtime these wood toy sets provide. Playing with wooden toys gives children a well-needed break from the bells and whistles, lights and sounds found in electronic toys and gadgets. 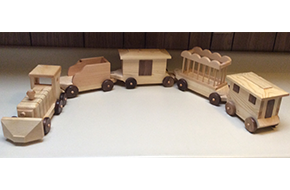 Absolutely Terrific Wood Toys is where you will find a variety of classic, handcrafted wooden toys for sale. I design and craft toys in my Salt Lake City, UT wood shop and sell them locally and online to customers all over the United States. My biggest fans are those who remember the wood toys they were given as a child and enjoyed for many years and want to pass that memory along. Handmade wooden toys never go out of style. That is what makes them classic. For parents who grew up with a wooden train set or wood doll house, buying them for their children is a delight. They want their child to get as much enjoyment from wood toys as they did as a child. 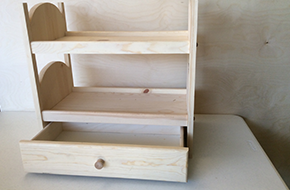 The sheer simplicity of wooden toys makes them popular with parents and children alike. All of my designs are simple to handle for clumsy little hands, and generic in shapes to help fill a child’s imagination. Wood toys are the best alternative to the plastic toys on the market today. 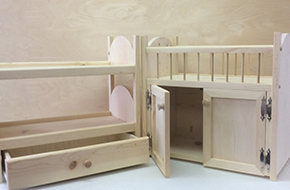 My line of wood products includes the classics: doll furniture, rocking horses, hardwood spinning tops, wooden train sets, and children’s furniture. There is a little something for everybody. Explore my inventory at Absolutely Terrific Wood Toys in Salt Lake City, UT.